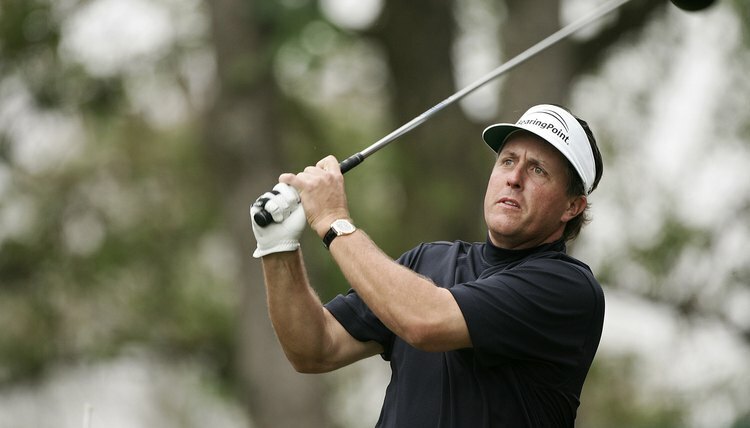 Phil Mickelson is among the PGA Tour pros who have used lead tape on their clubs. Many golfers attach lead tape to their clubs to alter the ball’s trajectory, to help cure a swing defect or to adjust the club’s feel. Expert opinion isn’t unanimous on lead tape’s benefits, but some PGA Tour pros – Phil Mickelson, for example – have used lead tape on their clubs. Lead tape won’t completely cure a bad golf swing, but it may help smooth out a rough spot. Depending on the size of the roll, a 1-inch strip of lead tape typically weighs about 1 gram. If you think it may help, take your driver and a roll of tape to the driving range and experiment. Add tape to the driver’s toe (the clubhead area that's farthest from the shaft) to help reduce a hook or to promote a fade – a controlled left-to-right movement of the ball (for right-handed golfers). The tape slows the clubhead’s rotation by placing more weight farther from the axis of rotation at the shaft. Place the tape on the outside of the driver or beneath the toe. If you slice the ball, place a strip or two of tape on the driver’s heel (near the shaft), typically on the bottom of the clubhead. With the toe area now lighter than the heel, it’s easier for the toe to swing around and square the clubface at impact. Many recreational golfers find it harder to square the face of larger clubheads, such as drivers. Alter the club’s center of gravity by placing tape on the back of the driver or the rear of the club’s bottom. The typical driver’s center of gravity is already low and fairly deep in the clubhead, a bit toward the toe. Moving the center of gravity even farther back (also a key principle of hybrid clubs) will help golfers loft the ball. Start by adding tape on the back of the driver’s clubhead, a bit toward the toe side. Counterbalance your driver by adding tape around the grip area. This strategy may help golfers who have trouble with relatively heavy clubheads. For example, a driver with a lighter shaft has more weight concentrated in the clubhead. To a golfer switching to a lighter-shafted club, the relatively heavier clubhead may feel uncomfortable. Adding some lead tape around the driver’s grip can balance the club’s weight and make it more comfortable. Other golfers may simply prefer the feel of a bit of extra weight around the grip. Says two-time U.S. Open champion Retief Goosen: "I put it on a few wraps below the grip. It feels more balanced with the tape."